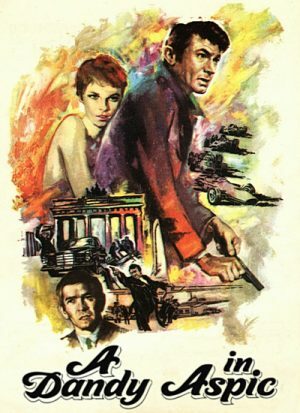 • Commentary - in this new audio commentary, author and critic Samm Deighan discusses the visual style and tone of A Dandy in Aspic, the nature of the key conflicts in the film, its unique opening credits, the type of protagonists that populate Anthony Mann's films, etc. • The BEHP Interview with Christopher Challis - presented here is an archival interview with cinematographer Christopher Challis in which he discusses the progression of his career and some of the major projects that he was a part of over the years. The interview was conducted by film historian Kevin Gough-Yates, as part of the British Entertainment History Project, on October 11, 1988. Audio only, plays over the film. (107 min). • Isolated Music & Effects Track. • Image Gallery - a collection of vintage promotional materials for the film. • Berlin: The Swinging City - this short vintage featurette highlights some of the key locations in Berlin where A Dandy in Aspic was shot. In English, not subtitled. (5 min, 1080p). • London to Berlin - this featurette highlights additional locations from Berlin and London that are seen in A Dandy in Aspic. With music and text descriptions. (6 min, 1080p). • Inside Mann - in this new video program, critic and broadcaster Richard Combs discusses the evolution of Anthony Mann's style and the visual appearance and some of the key themes of A Dandy in Aspic. The program was produced for Indicator/Powerhouse Films in 2019. In English, not subtitled. (12 min, 1080p). • Pulling Strings - in this new video program, titles designer Michael Graham Smith and puppeteer Ronnie Le Drew discuss the creation and unique appearance of the opening credits for A Dandy in Aspic. The program was produced for Indicator/Powerhouse Films in 2019. In English, not subtitled. (23 min, 1080p). • A Time to Die - in this new video program, second assistant editor Richard Dobson, continuity manager Elaine Schreyeck, special effects artist Terry Schubert, camera assistant Nigel Cousins, and stuntman Colin Skeaping discuss the production of A Dandy in Aspic and their interactions with and/or impressions of Anthony Mann, Tom Courtenay, Mia Farrow, and Laurence Harvey. (There are some particualrly interesting observations about Laurence's personality). The program was produced for Indicator/Powerhouse Films in 2019. In English, not subtitled. (10 min, 1080p). • Trailer - a vintage trailer for A Dandy in Aspic. In English, not subtitled. (1 min, 1080p).